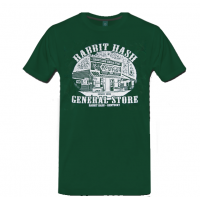 How in the world does a town get to be named Rabbit Hash? On January 3, 1879, a Post Office was established with the name "Carleton." Two months later the folks from the Post Office decided to change it because it was getting confused with "Carrollton." So they re-named it to "Rabbit Hash" and here are some of the theories why that name was chosen. During the flood of 1816, two travelers were looking for something to eat. When they asked about the availability of food they were told that because the flood drove so many rabbits into the hills, there were plenty of rabbits available to make hash. The travelers, according to Yealey, were salt or fur agents looking for something to eat while using Meek's ferry. Meek's ferry crossed from Rising Sun to Rabbit Hash from 1816 to 1840. Christmas Day, 1847, the Ohio River was at flood stage. The residents of Rabbit Hash that were on the banks had been flooded, and the owners were compelled to seek quarters with their more fortunate neighbors. Snow, two feet deep, covered the ground, and that, combined with extreme cold, made communication with the outside world extremely uncomfortable and somewhat hazardous. Instead of the usual rejoicing, a pall of gloom overspread the country. No roast turkey and mince pie, nor eggnog, nor rum flip were to be had, or expected. 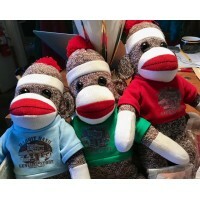 On this Christmas morning conversation was spiritless and few words were uttered. "Well, Frank, what are you going to have for your Christmas dinner?" He answered in just two words: "Rabbit Hash." 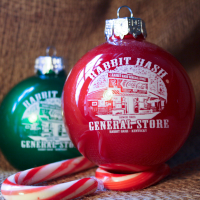 This version's timeline of Christmas 1847 is actually 32 years before the name was changed from Carleton to Rabbit Hash. Regardless of the date, this is one of the most popular of Rabbit Hash stories. The common denominator appears to be a flood which renders more than enough rabbits to eat for supper. Where it starts to vary, besides the date, is that the story's "punch line" is delivered by either a poor unfortunate wretch, a town wit as a joke, or even the town drunk. On October 15, 1983, the Cincinnati Enquirer repeats the Christmas story above, but also gives a name to the man who uttered the two words -- Frank Elson. A somewhat unusual name for a community, yes, but still pretty much at home with names like Big Bone, Beaver Lick, Gunpowder, or even Idlewild. 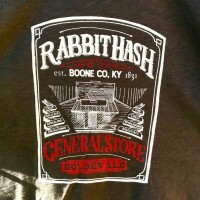 Boone County Historical Society learned recently how Rabbit Hash got its name. The explanation came in a letter to Mrs. Schuyler Lockwood, Florence, and was revealed by William Fitzgerald, society secretary. The writer of the letter was Mrs. Millicent Piatt Floyd, who formerly lived near Rabbit Hash. Her grandfather, John Piatt, built a rambling white house near East Bend on the Ohio River, which was washed away in the flood of 1937. Her uncle, Robert Piatt, ferryboatman between Rabbit Hash and Rising Sun, Ind., and "quite a practical joker," played a leading role in the village's naming, Mrs. Floyd recalled. A young doctor of the community known only as Cowen (believed to be Dr. C. L. Cowen, who died in Rising Sun in 1920) was fond of rabbit and often hunted them, according to Mrs. Floyd. Once, he returned with a full game bag and hung his bunnies up to freeze while he went about making his calls. Robert Piatt took the rabbits, and later invited the physician to his home for a dinner of rabbit hash. Accepting, Dr. Cowen enjoyed himself and his dinner but didn’t know he was eating his own game. As the joke spread, the victim became known as "the rabbit hash doctor," Mrs. Floyd wrote. "The village, from whence he came, finally accepted the name Rabbit Hash," she added. So which is it? No one really knows for sure. Got an idea? Post your comments below if you think you know!